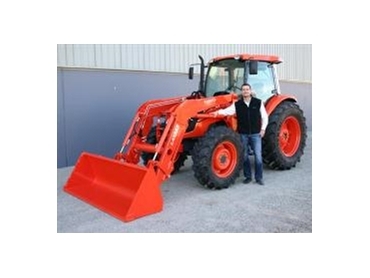 New loaders specifically designed for Kubota’s 60 – 95 horsepower M40 Series tractors are now available. According to Kubota’s Product Manager Lars Pasedag, the addition of the loaders to the M40 range completes the package offered to farmers. “Since the introduction of the M40 series in 2006 feedback from customers has been very positive. As an all around utility tractor capable of handling harsh Australian working conditions, the M40 tractors have proven themselves in a variety of applications including hay baling, mowing, raking, spraying and slashing etc. Now, with the release of the new loaders, farmers can take advantage of using a loader that perfectly matches the capabilities of the tractor,” Pasedag said. The new loaders are made in Kubota’s Industrial Equipment factory in Jefferson Georgia USA. They incorporate a hydraulic self levelling lift system that keeps the attachment level to the ground. The hydraulic self levelling system results in a very appealing look, but also benefits the overall design of the loader, as no levelling links run on top of the loader arms, obstructing the view of the operator. All hydraulic pipes are neatly tucked inside the loader arms. A euro style quick hitch for easy attaching and detaching of implements is equipped to each loader. Lift capacity for the LA1153 which fits tractor models M6040 (60hp) and M7040 (67hp) is 1,150 Kg and 1,350 Kg for the LA1353 which fits the M8540 (85hp) and M9540 (95hp). Maximum lift height of 3.4 meter can be achieved on the LA1153, while the LA1353 achieves a lift height of 3.7 metres. The bucket rollback angle of 43 degrees for the LA1153 and 40 degrees for the bigger model LA1353, with a dump angle of up to 60 degrees, allows for an excellent bucket working range. The operator can now set up the loader to suit their own application, as they have the choice of lifting height or lifting power whatever is required at the time, by simply adjusting the lift cylinder to a different position. The loaders come with a standard bucket or optional 3rd function valve in combination with a 4in1 bucket (LA1353 only). Other optional attachments include a bale spear, pallet fork and hydraulic round bale grab. Kubota’s Shockless ride accumulator system – available for both loaders- absorbs the shock from the bouncing loader, resulting in a smoother ride for the operator. For users wanting to remove the front end loader frequently this procedure is extremely user friendly, with the use of the boom stands and two mounting pins. An optional single lever quick coupler to simply remove all hydraulic hose connections at once is also available.